What Wikipedia does not know, however, is that histamine is “important substance contributing to the normal day-to-day response to exercise in humans” (Romero. 2016a) and that blocking it will also block a significant part of “the human response to exercise, [which] includes an altered expression of thousands of protein-coding genes,” because it “appears to be driven by histamine” (Romero. 2016b). With that being said, I guess it’s about time to tell you that I got the above quotes from (a) a recent press release with the ambiguous title “Antihistamines affect exercise recovery, may or may not be a problem” and (b) the corresponding study that has just been published ahead of print in the Journal of Phyisiology (Romero. 2016b). Figure 1: Effect of histamine receptor blockade on differentially expressed protein-coding genes after exercise (Romero. 2016b). “We need to do a training study in which we put people on histamine blockers and see if their adaptations to exercise training are as robust or diminished. There are a lot of redundancies in physiological systems. I wouldn’t be surprised if blocking histamine receptors ends up being overcome by something else, but I also wouldn’t be surprised if we can demonstrate that some responses to exercise training do become blunted if you take high doses of histamine blockers” (Romero. 2016a). Anti-histamines may block the beneficial effects of exercise on glucose metabolism: There’s not just one, but there are two studies that indicate that using H1 blockers may impair the post-exercise increase in insulin sensitivity / glucose metabolism in general. There’s Pellinger’s 2010 study that found that the use of histamine H1-and H2-inhibiting drugs reduces not just the postexercise skeletal muscle interstitial glucose accumulation, but also the hyperemia (=increased blood flow to the muscles) and may thus in fact slow down the recovery from exercise. Figure 2: Matsuda insulin sensitivity index in response to oral glucose load following exercise and nonexercise sham. Open bars denote control day; filled bars denote H1- and H2-receptor blockade (fexofenadine and ranitidine) day. *P < 0.05 versus control (Pellinger. 2013). The second study is a bit more concrete (Pellinger. 2013). It comes from the same group of researchers. This time, however, the scientists tested the logical follow-up question, whether the previously observed effects would also affect the increase in insulin sensitivity following exercise. To this ends the scientists had 20 healthy young subjects (12 exercise; eight nonexercise sham) randomly consume either control or H1‐ and H2‐blockers (fexofenadine and ranitidine) days. To assess the effects of the drugs on the glucose metabolism post exercise, the subjects then cycled at 60% of their VO2 peak for 60 min. 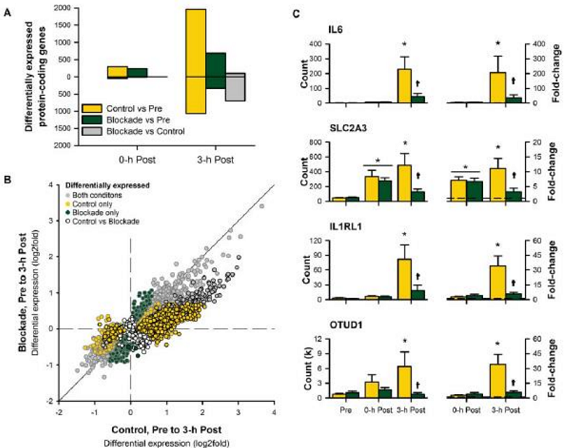 Afterwards, the scientists conducted postexercise whole‐body insulin sensitivity tests (Matsuda insulin sensitivity index) and found that the former was reduced by 25% with H1‐ and H2‐receptor blockade (P < 0.05). Interestingly enough, the “pro-diabetic” effect is limited to exercised individuals. In a sham trial, where the subjects simply sat around for 60 minutes, a similar effect on insulin sensitivity was not observed. So, the scientists are right to conclude that their “results indicate that insulin sensitivity following exercise is blunted by H1‐ and H2‐receptor blockade.” Since this ill effect is probably mediated by the previously observed blunting of the exercise-induced skeletal muscle vasodilatation, it is only logical that the same effect was not observed in the sham trial. Antihistamines block the post-exercise reduction in blood pressure: Closely related (mechanistically) to the previously cited effects on glucose metabolism are the results Sam Pickles presented in his 2015 undergraduate degree thesis. In the corresponding study, Pickles had his young healthy subjects perform 4×4 minutes of interval training at 85% VO2max or 30 min of continous exercise at 75% of VO2max – both either with or without antihistamine ingestion. And guess what!? Yes, you’re right: The ingestion of the antihistamines redued the post-exercise hypotensive effect (PEH) of both types of exercise by ~3.7/ 3.2 mmHg, a measurable, but not a statistically significant. (p=0.177 and 0.183, for interval and continuous training, respectively) difference, and still: since the mechanism (reduced hyperemia) appears to be clear, the results are relevant and Pickles is right to point out that “further research is required to determine the clinical implications of the interaction between antihistamines and the scale of PEH when prescribing antihistamines for patients using exercise as an intervention for hypertension” (Pickles. 2015). 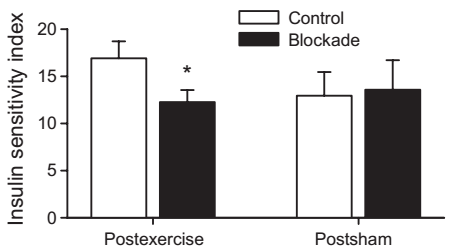 Antihistamines block the energizing effects of exercise: In another 2016 study, Loy et al. tested the effect of histamine on changes in mental energy and fatigue after a single bout of exercise in 20 women with low vigor and high fatigue. The subjects received the H1 antagonist drug doxepin hydrocholoride (6 mg | aka SINEQUAN, an anti-histamine that’s prescribed for depression and anxiety) in tomato juice and tomato juice alone (placebo) in a randomized, double-blinded, cross-over experiment before performing 30 min of light intensity cycling exercise and completing energy, fatigue, sleepiness, and motivation scales, and cognitive tasks. 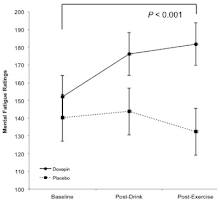 After exercise, mental fatigue increased for the doxepin condition (p = 0.014) but not placebo (p = 0.700), while mental energy decreased for both PLA and DOX (p < 0.001) and cognitive task performance was unaffected. Reason enough for the authors to infer that “histamine binding to H1 receptors in the brain has a role in exercise-induced reductions in mental fatigue, but not increases in energy” (Loy. 2016) – a logical conclusion, but we are still far from understanding histamine and its various physiological effects on the body. 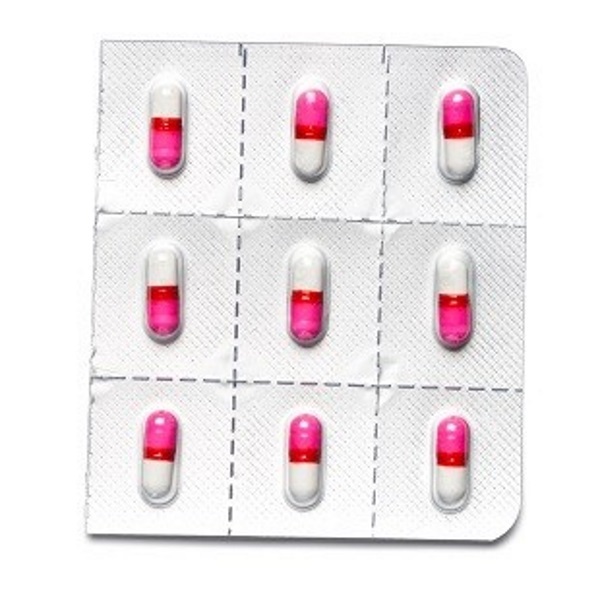 Bottom Line: Ok, even with the additional research we are not able to say for sure that (a) taking any antihistaminergic drug will affect your response to exercise or (b) how significant this effect can be, but what we do know is that there’s at least a high chance that antihistamines, similar to high doses of vitamin C + E, by the way, will blunt some of the beneficial adaptive effects that occur after / in response to exercise. With that being said, it is not clear that this is another case of blunted hormesis, but as Romero said: “Histamine [is] a substance that we typically think of negatively” – and that’s the exact same for reactive oxygen specimen aka ROS, which are just like their positive effect on glucose management (Ristow. 2009) and your gains blocked by vitamin C + E | Comment on Facebook! Loy, Bryan D., and Patrick J. O’Connor. “The effect of histamine on changes in mental energy and fatigue after a single bout of exercise.” Physiology & behavior 153 (2016): 7-18. Pellinger, Thomas K., et al. “Local histamine H1-and H2-receptor blockade reduces postexercise skeletal muscle interstitial glucose concentrations in humans.” Applied Physiology, Nutrition, and Metabolism 35.5 (2010): 617-626. Pellinger, Thomas K., Breanna R. Dumke, and John R. Halliwill. “Effect of H1‐and H2‐histamine receptor blockade on postexercise insulin sensitivity.” Physiological reports 1.2 (2013): e00033. Pickles, Sam. The Effect of Intensity on Post-Exercise Hypotension: Is Post-Exercise Hypotension different following high intensity interval exercise when compared to continuous exercise and do antihistamines blunt the hypotensive response?. Diss. Cardiff Metropolitan University, 2015. Romero in “Antihistamines affect exercise recovery, may or may not be a problem.” Medical Press, April 14, 2016a | < http://medicalxpress.com/news/2016-04-antihistamines-affect-recovery-problem.html > last: April 15, 2016. Romero, Steven A., et al. “Evidence of a broad histamine footprint on the human exercise transcriptome.” The Journal of Physiology (2016).